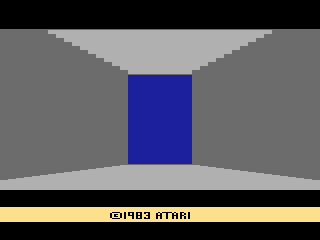 Originally released through the Atari Fan Club. 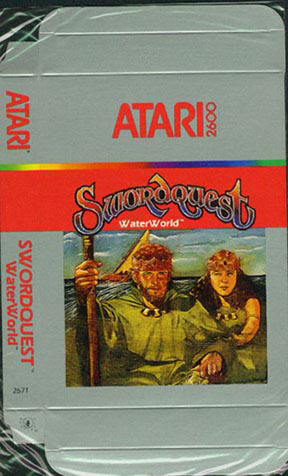 SwordQuest: WaterWorld was the third game in the defunct SwordQuest series. In many ways the style of WaterWorld is a throwback to EarthWorld after the disaster that was FireWorld. Overall WaterWorld is a much simpler game than the others in the series, as the puzzles have been modified so that you only need four out of the seven items that the room will accept to trigger a clue. The rooms will even give you hints as to what items your missing should you use a wrong combination. This was a big improvement over the earlier unforgiving puzzle sequences. 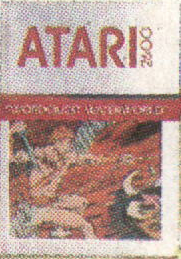 WaterWorld was originally only available through the Atari Fan Club, but was later sold in stores (after the contest had been canceled). It was during this time that Atari (losing money fast) decided that the contest was too expensive to keep going and abruptly canceled it. It's unknown if anyone was awarded certificates of merit for WaterWorld, but the national contest was not held and the crown was never awarded. What happened to the crown after the contest was canceled is anybody's guess. WaterWorld is much smaller than EarthWorld and FireWorld as it only has seven rooms and three different action sequences. The rooms are based off of the Yoga theory of the Chakra. The Chakra is one of the seven centers of spiritual energy in the human body, so the rooms in WaterWorld are numbered I through VI plus room 0. 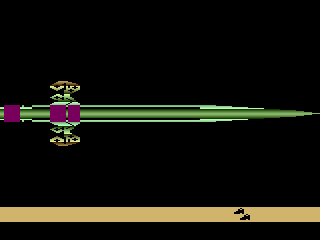 Unlike earlier games, you can access a rooms items even if you fail the action sequence, however there will be one item that does not appear. This speeds up the game by not making you have to win an action sequence simply to drop items off in the room. But to win the game you will still need to beat all the action sequences, as the items that don't appear are necessary for the clues. The story now takes the twins to the mysterious WaterWorld, which appeared after they were sucked into the FireWorld chalice. Tarra heads for the surface while Torr is caught in seaweed. He discovers a skeleton in the weeds wearing breathing apparatus, and also a creature intent on killing him. Torr manages to kill the thin, discarding his armor, but blacks out and the monster's death throes break away the seaweed. This causes the skeleton to come free, rising to the surface along with Torr's armor. Tarra dives in to look for Torr and sees the skeleton, which leads her to believe that he is dead. While Tarra cries and Torr floats unconscious, Konjuro casts forgetfulness upon them. Torr wakes to find himself surrounded by sharks. He dives to elude them and discovers a city and its ex-queen Aquana who was imprisoned by Konjuro eons ago. Since he doesn't remember his own name, she calls him Aquon and expresses a desire to find the Crown of Life to regain her throne. Meanwhile, Tarra is awoken by whales hunted by a huge ship carved entirely of ice. She ends up on the ship and can't remember her name either. Cap'n Frost calls her Dawn Hair and reveals his desire to find the Crown of Life and to rule all of WaterWorld. Soon, the ship is besieged by whales and the Serpent Unspeakable, under the control of Aquana, and the war is on. After both leaders are incapacitated, Herminus manages to set the twins against each other in a duel, with the scepter that controls the Serpent and the ship Ice Queen as the stakes. However, the twins stop in mid-duel to ask their deities for guidance. They summon the Mentors, who break the spell of forgetfulness. The twins throw down their swords, revealing the Crown of Life, as well as slicing it in two. Aquana and Cap'n Frost are each given half the crown to share the rule of Waterworld, and the sword appears again. As the twins grab onto it, they are carried upward and Herminus is caught in the updraft in an attempt to reach it himself. Meanwhile, Tyrannus and Konjuro prepare to meet the twins in the final realm, AirWorld (which of course never happens). There are only three different action sequences in WaterWorld, and one of them is actually from EarthWorld. Unlike the pervious installments, the action sequences actually take place between rooms and not in the rooms themselves. Ice Floes This is basically the Aquarius Rapids test from EarthWorld, except now your jumping on ice floes instead of rafts. Other differences in this test are that the ice floes don't disappear from under your feet like the rafts did, and the floes aren't randomized. You only have a limited amount of time to reach the other side of the ice floes, if time runs out you will fail the test. Possessing the Medallion will allow you to skip the ice floes between all rooms, while the Money Purse will allow you to skip them between rooms V & IV. The Crown allows you to skip all the action sequences (including the Ice Floes). School of Octopi In this test you must swim down from the top of the screen to the hole in the bottom while avoiding the moving octopi. If you hit an octopus, your character will be bumped back slightly but otherwise unharmed. You only have a limited amount of time to reach the bottom so don't delay! Possessing the Royal Seal or Crown will allow you to skip this test. This is the hardest test in WaterWorld. 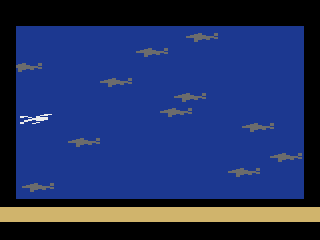 You must carefully swim from one side of the screen to the other in the middle of a large group of deadly sharks. If you touch a shark you will be sent back to the start of the test against the left wall. If you can make it to the other side of the screen before time runs out you will pass the test. Possessing the Money Purse will allow you skip the Sea of Sharks between rooms III & IV, and the Crown will allow you to skip all the shark tests. Since there are only three different action sequences, the number of items with secondary uses is quite small. Allows you to skip all action sequences. Allows you to skip all Ice Floe tests. Allows you to skip the School of Sharks between rooms II & III and the Ice Floes between rooms V & IV. Allows you to skip all School of Octopi tests. As usual, there are a large amount of items that are only used to reveal clues. WaterWorld has an interesting 'feature' which causes the game to reset after a clue is revealed unlike the other SwordQuest games which continued onwards. The reason behind this is to show that you don't need to solve all the puzzles in order and to reset all the items for the next puzzle. While this probably made sense from a contest standpoint, it ruins the 'game' feeling and makes the whole thing feel like the contest tool that it was. There is a small bug in the game which causes the walls of certain rooms to become invisible, but this is more of a nuisance than a hindrance. Reset 'feature' aside, WaterWorld is the best of the three SwordQuest games and actually verges on being fun to play. 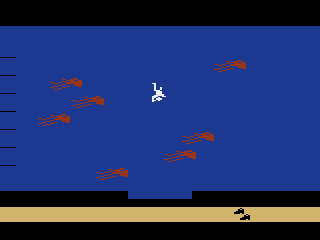 The sounds are pleasant to hear (unlike FireWorld's painful beeping), the graphics are more detailed, and there are now musical cues throughout the game. 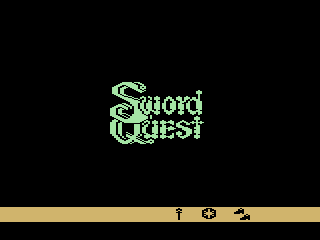 It appears Atari finally learned from their earlier mistakes and started making the SwordQuest games the way they should have been from the very start. Very early artwork for the WaterWorld box was shown in some advertisements. It's doubtful this artwork would have been used as it is very different than any of the other SwordQuest games. A prototype box bearing different artwork has surfaced but was ultimately unused. 20-7 Waterworld 20-7 Final Version?